Alina Starkov is a Grisha and a sun-summoner, although she is a little rusty. She has one of the most powerful ranks in all of Ravka, and everyone wants to try to keep her safe because the Darkling wants Alina so that he could put her under his rule. The Darkling rules Ravka from the Shadow Folds, which is a dangerous forest where terrifying creatures lurk. The Darkling has an army that is exceedingly successful, and Alina has an army that is the remainder of what was once a good army. Everyone is on the hunt for the Firebird that is going to destroy Ravka. Days before the great battle, the Darkling told Alina some other news that would change the way she saw things. He told her that he has hostages, some were teachers and children. They were caught by the Darkling to try and distract Alina from thinking about how he is going to destroy Ravka with the firebird and Mal. Alina has two big dilemmas, the first one is that she needs to save the hostages, and the second one is that she needs to save her boyfriend and ragged tracker, Mal. Mal is the only person who knows where the Firebird is. The Darkling wants Mal so that he can destroy Ravka. Mal, short for Malyak Ostretsov, has to fight against the Darkling to save the kingdom and free Ravka with Alina. But sometimes, Alina will have to sacrifice the future that she was fighting for. 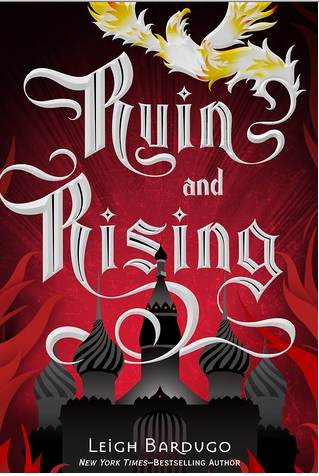 Personally, I thought that some of the strengths for Leigh Bardugo was the fact that she added a great amount of detail even to the “not-so-important” parts of the story. I feel like her backstory also has an impact on my opinion of her book. She went to Yale University and she is also a recreational singer in a band in Hollywood. She has also written two books before this one which makes her an experienced writer. Some of her weak points was the fact that she did not add as much vocabulary words as I would have liked it to be. That way it was a little bit of an easy read for me. The age group that I would recommend this book to would be younger middle school students about seventh grade level. If I went back in time, I definitely would have chosen this book. Overall, I would grade this as an eight out of ten. 2.What was their only hope for finding the Firebird? What was it called? 3.What do people call Alina? 4. How does Alina feel about Zoya and Adrik? Why? 5. What job does Alina have when they are crossing the mountain of West Ravka? 7. Why was Sergei missing from the castle? 8. Who is Magnus Opjer? 9. Who was in Alina’s room? 10. What did the constructors build a church over? 11. What did the road lead to? 12. What did the Darkling say to Alina about the hostages? 13. What were the different things Alina was trying practice to get ready for the battle against the Darkling? . 14. What happened at the war against the Darkling and what did Alinan have to do to save Mal? 15. What happened to the Darkling?